Imagine every one of your shots in the middle of the fairway, every chip two feet from the hole and every putt nailing the center of the cup. Well, maybe some of us dream of never having to ever putt and each approach shot goes into the hole, but I think you get the picture. A consistent swing is probably what many golfers dream of when our heads hit the pillow. The majority of us are aware that golf is a game that requires consistent shot making to be successful (and have fun). If we are hooking, slicing and hitting our wedges fat, it can really start to get frustrating. Consistency is key to recording a low score and enjoying the game. So how do we get there? First, let us do a little review of the golf swing. To hit the ball squarely on the center of the club head you must take the club through the proper swing path. A proper swing path will allow the club to align itself correctly with the ball to hit the shot you are trying to hit. For more advanced players this could be in the form of a draw, fade, cut, or some other variation. Higher handicappers will be happy with just plain old straight shots. Anyway, this process begins with your address, moves through your take away, into the back swing, onto the transition between back swing and down swing, into contact and finishes with the follow through. That's quite a complex sequence of events for the body to perform. And we all know that if our timing is slightly off, or we are just a little off mechanically, disaster is the result. Knowing that a consistent swing requires the execution of these complex moves over and over again is quite mind blowing. But let's get back to our question: How do we develop a consistent golf swing? The answer is two-fold, and I imagine most golfers are aware of the first point but probably only a few are aware of the second. Got it? Good, now I can stop writing this article and all of us can become scratch golfers, right? Well, not exactly, and I imagine some of you are saying, "I already know all this stuff." Others may be quite intrigued. Regardless of which category you fall into, let me expand on each of these topics a little. Golf Swing mechanics is probably the easier of the two areas to understand. It's the reason why we take golf lessons and practice so much at the range. Beginning at address, moving through all the stages of the golf swing and finishing with the follow through, the body is required to move through a specific sequence of movements to perform the golf swing correctly. If the body doesn't move through this sequence properly then the result will be a poor, inefficient and awkward looking swing. Over time, a poor swing results in poor consistency (every once in awhile you hit a good shot regardless of your swing, that's what keeps us coming back for more). An easy example of this is when you "come over the top" with the club. This usually results in a slice (I know, easy thing to do and very hard to correct). In addition to the body performing an intricate number of biomechanical movements in the golf swing, timing of these movements is critical for you to hit the ball successfully. 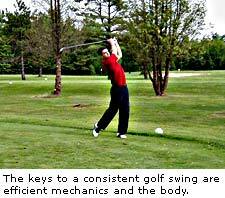 Each and every biomechanical movement within the golf swing has a certain sequence and timing. If they are not performed in the correct order or timing, then the golf swing will not be efficient. Poor timing results in those wonderful slices, snap hooks, chili dips and topping the ball that we know all too well. Proper instruction (Find a good teacher and stick with that teacher. Most of the pros do, why not you?). Practice, practice, practice. As they say “practice makes perfect” and I believe this is true when it comes to the golf swing. Now, on to the second point when it comes to consistency in golf. Again, this is probably the lesser known of the two points about consistency in the swing. It's also equally as important as the mechanics of your swing. One question might help you realize the importance of "the body" when it comes to the golf swing. What swings the golf club? Some of the answers I have heard are: "my hands," "the swing," "my hips" and even "the grip." Well, these answers are in the ballpark and are close to being right, but let me simplify it for you. The answer is your body. Quite simple when you think about it: The club head is attached to the shaft, your hands grip the shaft, your arms are attached to your shoulders, your hips rotate through the swing and on and on we go. It is the body that swings the club. So why is this so important to consistency in your golf game? We know from our lessons, that there are certain positions the body is required to be in during the swing. For example, at address we know that the feet are slightly wider than shoulder width, knees slightly bent, back at a certain angle, head in a specific position and our hands gripping the club a certain way. This is only the beginning of what the body has to do to swing the club correctly. Now, from the address position your body must move the club on the correct path and generate club head speed to hit the ball accurately and with power. Doing this over and over is what we define as consistency. What most people don't understand is that for the body to perform the golf swing correctly, certain parameters need to be met by the body. The body must have certain levels of flexibility, strength, endurance, balance, stability and power. If your body doesn't have the minimal levels of these factors in relation to the golf swing, then what do you think will happen? Well, let me tell you, it will be very difficult for the body to swing the club with the correct mechanics. And what will this result in over time? A large amount of time spent on the range with little improvement on the course and a swing that looks less than desirable. So what does consistency in my golf swing really come down to? It's vital to understand that improvements in your golf swing mechanics and improvements in your body specific to golf are equally important when it comes to creating a consistent golf swing. If you ignore either the body or the mechanics, it would be safe to say that your golf swing and game will suffer. Take some time on a routine basis to address both the mechanics of your swing and the body supporting it. I think you'll find the benefits to be very rewarding. Sean M. Cochran is one of the most recognized golf fitness instructors in the world. He travels the PGA Tour regularly with 2004 Masters Champion and 2005 PGA Champion Phil Mickelson. He has made many of his golf tips, golf instruction and golf swing improvement techniques available to amateur golfers at his Web site, BioForceGolf.com.